First of all, the app's easy to use. You can customize your entire order, including individual settings (i.e. no salt or well-done fries) toppings and even allergies. Talk about thorough. It also provides a price for each item or premium topping (which is greatly appreciated) in addition to a list of available rewards. In this case, the aforementioned free Regular Fry. I ordered a Double Burger with Fries. Grand total (including tax) $10.43. I tried to redeem my reward several times, to no avail. Evidently, free fries is more of a pipe dream than a reality. When I stopped by the restaurant (a few minutes later) to collect my order, I let them know about the mishap. The employee told me that the fries would be free next time (wrong) and if I didn't get them, to tell an employee. Kinda what I was trying to do this time. Fool me once, shame on you, fool me twice, shame on me: I won't try again. Why bother? Fries notwithstanding, the order process seemed to work pretty well. Order in, at 6:34 PM. Ready for pick-up at 6:44 sharp. My food was packed inside an extra big bag, which contained two smaller bags. Smart. 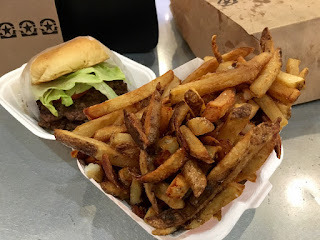 Unfortunately, it didn't save my burger (see below) but it did manage to keep BurgerFi's delicious fries nice and hot. Fix the rewards flaw, and this app would garner three, perhaps even 3½ (out of four) stars. With the flaw however, 2 stars. P.S. 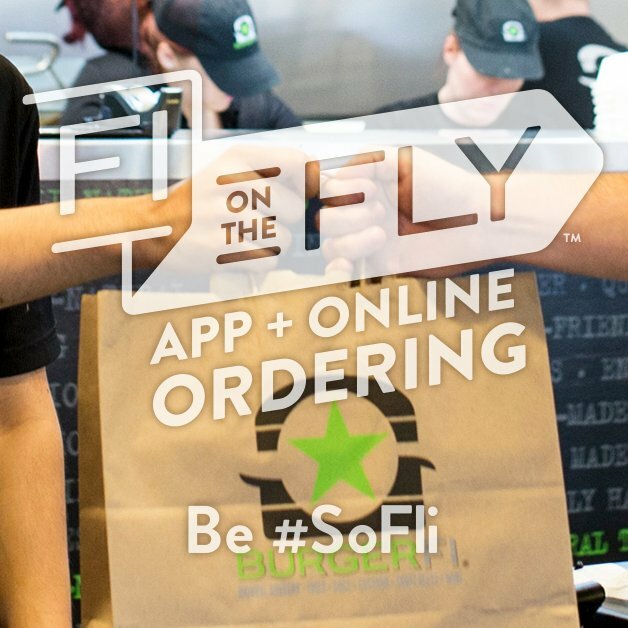 I Tweeted my dissatisfaction after, with no reply from BurgerFi's social media team. Ambiance: Almost perfect inside, save for a lack of lighting. Even the front patio is a bit too dark, although the entire restaurant is very clean, with upbeat music (Elle King, O.A.R.) and a decidedly friendly/hip "feel." Food: The fries were, are and always have been... fantastic. You get mounds of 'em, and they're well-seasoned. Reasonably priced too ($3.67 for a Regular) although they should have been free (and no, I'm not going to let that go.) The burger, on the other hand, was a complete disaster. Ice cold (I started eating it at 5:49) without the BurgerFi brand on top (hence the cold bun) and two cold, under-seasoned patties. If you're keeping score at home: That's three cold mentions in one sentence. Not good. For the first time ever, I didn't finish my BurgerFi burger. Even worse. Service: I interacted with only one employee, who was very, very nice. She didn't handle the rewards omission properly (info, solution) but it's hard to blame her for something the app didn't do. Overall: Not sure what was worse... the app snafu or the burger. Actually, it was the burger, but free fries would have motivated me to take the burger back and try again. Considering I struck out twice (on the same visit) I didn't have the heart to swing my bat a third time. What a shame. Problem is, BurgerFi got my money, but I didn't get the dinner I was deserved/expected.